The Awesome Oscillator was created by Bill Williams. This oscillator subtracts a 34-period simple moving average (SMA) from a 5-period SMA. It illustrates what’s happening to the market driving force now. The Awesome Oscillator (CAO) is an oscillator which presents as a histogram consisting of red and green bars below the price chart. The values fluctuate above and below the Zero Line. 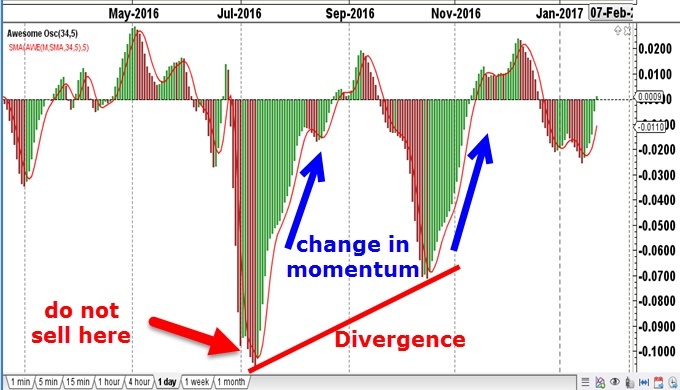 The Awesome oscillator can be used to measure market momentum, and is often used to determine the end of the trend with divergence. 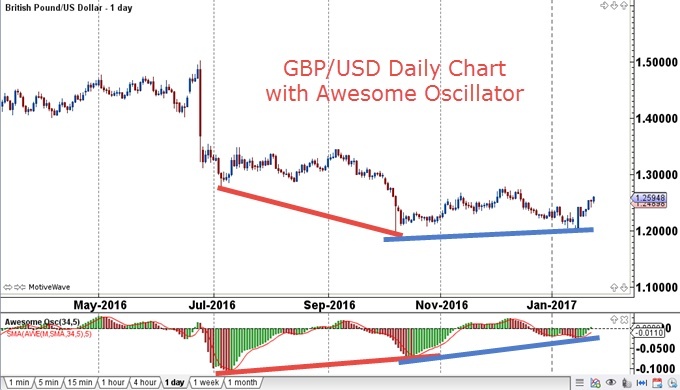 In the chart below, the Awesome Oscillator makes a higher low which indicates divergence when confirming with the GBP/USD price chart above. The “do not sell here” warning points to the lowest point on the histogram. One would be prudent to wait for the CAO to come back to the zero line before looking to sell again. Traders use the Awesome Oscillator indicator to recognize trends, corrections and reversals. The indicator tells you whether the market is trending and how strong the trend is. When the Awesome Oscillator histogram continues to drop below the zero line, the downtrend is strong. As soon as the awesome oscillator histogram bars go from red to green in a downtrend, its best to take profits on short positions as the momentum is changing and the market is due for a correction. When the Awesome Oscillator histogram is above the zero line with increasing green histogram bars, the uptrend is strong and strength is increasing. As soon as the green histogram bars change to red, that signals a change in momentum and a warning to get out of long positions ahead of the correction. The Awesome Oscillator also shows divergence which can be a sign of a weakening trend or a trend reversal. When price makes a higher high and the Awesome Oscillator makes a lower high, this is called divergence with declining momentum. Traders can get forewarned about an imminent market reversal. In the GBP/USD Daily chart above, price makes a lower low and the Awesome Oscillator is making a higher low. (red trend lines) That is called positive or bullish divergence and it is expected for price to turn around at least until the awesome oscillator returns to the zero line. At the bottom of the first CAO histogram low, the red bars turn to green as price corrects. In a strong trend, the correction will likely be sideways, and in a weak trend, the correction can be steep. In this example, the correction is weak and sideways. Once the CAO returns to the zero line (reversion to the mean), price drops again in trend continuation. Once bullish divergence occurs, price corrects (reversion to the mean) once more before dropping again. On this last drop in price, it almost double bottoms without making a new price low so technically this isn’t called bullish divergence (blue trend lines). Even so, with the higher low in the CAO, with the double bottom in price, that also provides confidence that the momentum has weakened and that price may in fact move higher again. Using the Awesome Oscillator provides a decent determination of trend direction, reversion to the mean and trend reversal and when used in combination with candlestick and price patterns, can form the basis of a trading strategy to trade the various market cycles. This indicator is one of the more popular indicators in the traders’ toolbox. See you next week for another “A” indicator! This entry was posted in Trading Tips and tagged awesome oscillator, bill williams, cao, forex.